Eskadron Climatex training bandage are made from highly elastic, hard wearing acryl-polyamide/lycra material, combined with a Climatex section which winds onto the leg first, providing optimum protection for any pressure points. Ideal for high performance competiton horses. 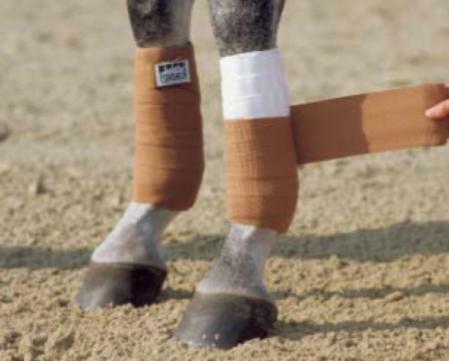 Climatex Training Bandages are easy to fit and ideal for high performance competition horses. 4 stars Excellent product, great service but slow postage. Would buy again! 5 stars Excellent product and excellent service. Product was dispatched same day as ordered and arrived very promptly the following day. Would definitely recommend and would use the website again for future purchases. Thank you for your service. 5 stars My daughter who is 14 years old has been riding horse and is taking part in several equestrian events in Japan. According to her opinion, your company keeps research on training bandage. So your products are the best. 5 stars I just love these bandages - I had 2 and bought these to complete my set of four. My horse struggles with really sensitive skin and boots tend to irritate him, these bandages give the perfect fit and I always use them for show jumping and cross country - couldn't recommend them more highly!! !